Here are the recipes I've chosen to try this week. "Frozen meal" usually means a meal I have prepared in bulk, then frozen to cook later. Lately it means something in a bag from the store. Oops. Maybe the shame I feel from admitting it publicly will catch up to me and I will get my act together to make more premade meals! Monday: Pan-Roasted Chicken Carbonara With Sautéed Escarole (I picked up some Swiss Chard as a local Farmer's Market and plan on using that instead of the escarole). A recipe from Rachael's husband! 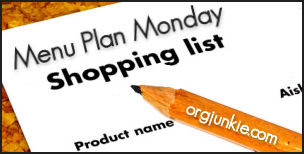 Check out more Menu Plan Monday posts here. The Asian Chicken Cutlets recipe is one of my staples! So good. I'm excited to try them tomorrow night! The carbonara chicken was good, but I made it too salty, somehow.